The whimsical names of Dreamy Duskywing and Sleepy Duskywing refer to their “closed eyes” --- the lack of a stack of white subapical dots at the “wrist” or leading edge of the dorsal front wing, marks which are usually found on the four other Erynnis species in Massachusetts, Juvenal’s Duskywing, Horace’s Duskywing, Persius Duskywing, and Wild Indigo Duskywing. Dreamy Duskywing usually has a small white dot near the leading edge of each front wing, dorsally, a dot which is lacking in Sleepy Duskywing. Dreamy Duskywing has a more northerly range than Sleepy Duskywing, it is found throughout Canada (Layberry 1998). Recent research shows that the more northerly Dreamy Duskywing is decreasing in Massachusetts, while the more southerly Sleepy Duskywing is increasing. But Sleepy is more restricted to dry sandy pine-oak habitats, while Dreamy is a habitat generalist, and within the state Dreamy has been more widespread and abundant until recently. Scudder and Burgess were the first to describe Dreamy Duskywing as a species in 1870, in a paper given at the Boston Society of Natural History. “Open roads through woods in hilly regions, especially if these be damp from the vicinity of streams, will be found the favorite place of resort for this butterfly, which never swarms, but is often found singly in great numbers” wrote Scudder in 1889, adding that the species was widespread and had been found in “almost every place where there are resident collectors.” For Massachusetts he cites Andover, Amherst, Springfield, Middleboro, Nantucket, and several places near Boston, such as Winchester, Belmont, Wyoming [in Melrose] and Mattapan (1889: 1511). As Newton naturalist Charles Maynard (1886) put it in that over-used phrase, Dreamy Duskywing was “not uncommon” at the beginning of the 20th century. 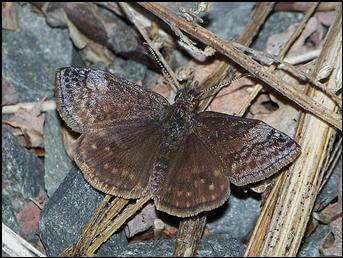 By the mid-20th century, Dreamy Duskywing was listed as “found everywhere” (Farquhar 1934). It was present on both Martha’s Vineyard and Nantucket (Jones and Kimball 1943; three F. M. Jones Vineyard specimens are in Yale Peabody Museum, species identification confirmed by J. M. Burns, and a seasonally early 4//28/1941 Jones specimen is in the MCZ, reported as found on "poplar." For Nantucket, two undated C. P. Kimball specimens are in the Maria Mitchell museum on the island). In the 1960’s Dreamy Duskywing was collected in Acton and Concord (Walden Pond Reserve) by C. G. Oliver, and in the 1970’s it was found in Medfield, Dover, Westwood, Needham, and Canton (Fowl Meadows) by R. E. Grey and W. D. Winter (specimens in Yale Peabody Museum and Harvard MCZ). Unlike Sleepy, Juvenal’s and Horace’s Duskywings, which use oaks as host plants, Dreamy Duskywing has been known since Scudder and W. H. Edwards to use mainly poplars and willow. Birch is also widely reported. Many species of poplar, willow and birch can serve as hosts, as well as one legume, black locust (Scott 1986). Some writers (e.g. Iftner et al. 1992; Cech and Tudor 2005) suspect that Dreamy Duskywing may also utilize oaks, but thus far evidence seems to be lacking. During the 1995-99 Connecticut Atlas eggs or caterpillars of Dreamy Duskywing were found in the wild on black willow (Salix nigra) and quaking aspen (Populus tremuloides). A surprise was finding Dreamy Duskywing larvae on black locust (Robinia pseudoacacia) in some xeric habitats, and Atlas authors wondered whether these might represent a host-specific race or subspecies (O’Donnell et al. 2007). Black locust is native to continental United States, but was introduced into New England. Dreamy Duskywing is not known to have adopted any non-native host plants. In Massachusetts, Dreamy Duskywing larvae have been found on both poplar and willow, for example on the Northern Worcester County NABA Count in 2000 and the Lower Pioneer (Springfield area; R. Pease) NABA Count in 1991 and 1992. Caterpillar photographer Sam Jaffe found two Dreamy Duskywing larvae in 2009, one early instar in July in a dry field in Millis on knee-high aspen, and one along powerline cut at Broad Meadow Brook WS in Worcester on a six foot bigtooth poplar in mid-late August, a final instar prior to over-wintering. Dreamy Duskywing is known as an adaptable species, at home in a variety of open habitats near woods, including both moist areas and dry pine-oak barrens. While Sleepy Duskywing is largely confined to dry pine-oak barrens where its host plant scrub oak is found, Dreamy is found in many habitats, from moist with willow to dry with poplars, so that the two duskywings cannot be neatly separated by habitat. The duskywings are a difficult group to identify to species in the field, and sight reports by less-trained observers probably contain some error. Most MBC members have been through a learning curve with these species. If full identification was not possible, the sighting was reported as ‘duskywing spp.’ in MBC records. These reports are not used in this account. MBC records 2000-2007 rank both Dreamy Duskywing and Sleepy Duskywing as “Uncommon” relative to other butterfly species, with the Dreamy somewhat more frequently found than the Sleepy (Table 5). Dreamy is the third most frequently-found duskywing, after Juvenal’s (U-C) and Wild Indigo (U-C). Sleepy and Horace’s are on the low end of Uncommon. An important list-length analysis of MBC data 1992-2010, published in the biological journal Nature: Climate Change (G. Breed et al. 2012), showed a statistically significant 53% decline in detectibility of Dreamy Duskywing over this period, compared to a statistically significant 104% increase for Sleepy Duskywing. As Dreamy Duskywing is more northerly in range, and Sleepy more southerly, the study illustrated the effect of warming climate on two key Massachusetts species. MBC 1992-2009 records of sightings per total trip reports similarly indicate decline in Dreamy Duskywing (Chart 75). The decline is obvious only since 2003. The year 1992 may not be comparable due to multiple double-digit single-trip counts (outliers), but decline is evident even if that year is discounted. Linear regression of the data also indicates significant decline 1992-2009, and unadjusted numbers seen show decline 2004 – 2009. By contrast, sightings of Sleepy Duskywing show an increase over this period. Statistics published in the Massachusetts Butterflies Season Summary also detail decline in this species. In 2007, 2008, and 2009, the average number of Dreamy Duskywings per trip report decreased 70.5% in 2007, 68% in 2008, 27% in 2009, and 27% in 2010 relative to the average for the preceding years back to 1994. The number of reports of this species and the maximum number reported were also down in 2007, 2008, 2009, and 2010 relative to the average for prior years (Nielsen, 2008-2011). In BOM-MBC records 1991-2013, Dreamy Duskywing was reported from 94 towns, compared to 42 for Sleepy Duskywing. No map is available for this species. The 1986-90 MAS Atlas found Dreamy Duskywing well-distributed across the state, although not as frequent on the southeastern plain, Cape Cod and the islands, or in Hampden County. BOM-MBC records yield a similar picture, except that today we have more records from the southern part of the Connecticut River valley south of Northampton, for example from Holyoke, Hampden, Westfield, and Monson. Overall in western Massachusetts, the greatest numbers of records and sightings are from Berkshire County. The twenty-three-year BOM-MBC 1992-2013 database has only one report of Dreamy Duskywing from Cape Cod (7, 6/9/1997, Falmouth Crane WMA, J. Sones), and none from southern Bristol County, despite many reports of Sleepy, Juvenal’s and Horace’s Duskywings from these areas. The furthest south location appears to be Plymouth Myles Standish SF; there are also many reports from Foxborough and Easton. However, Mello and Hansen (2004) list several reportedly reliable locations for Dreamy Duskywing on the Cape, and Hansen reports that it can be found at Crane WMA in Falmouth, along with Sleepy Duskywing (Stichter 2005: 32) Neither Dreamy nor Sleepy Duskywing adults are reported on the NABA Counts in July, because their flight period has ended. On Martha’s Vineyard, Jones and Kimball (1943) had reported Dreamy Duskywing as “not rare” and three of Jones’ specimens (no year, but species determined by J. M. Burns) are at Yale Peabody Museum. The 1986-90 MAS Atlas had no reports from the Vineyard, and in MBC records Dreamy is reported only infrequently and in small numbers. Matt Pelikan reported that at Manuel Correllus State Forest and on the Vineyard generally Dreamy is rare or uncommon, whereas Sleepy Duskywing is common (Pelikan 2002; Stichter 2005: 43). However, the last report from Martha's Vineyard was 1, 6/1/2007, West Tisbury SF, M. Pelikan. There were no reports 2008-2013, suggesting that the species may be declining there. On Nantucket, whereas Scudder had called Dreamy Duskywing “tolerably common” on that island, by the 1940’s Kimball had only two records, May 25, 1937, and June 1, 1940 (Jones and Kimball 1943). The Atlas had a single (apparently sight) report from Nantucket (Siasconset, 6/8/1988, W. Maple). MBC has no reports from Nantucket, but local observers feel that Dreamy Duskywing may be present (LoPresti 2011). Adams Greylock Glen max. 11 on 6/5/2001 P. Weatherbee; Mount Greylock max 13 on 6/5/2005 T. Gagnon et al. ; Chelmsford power line, 3 on 5/25/2008, T. Whelan; Foxboro Lamson Road max 6 on 5/20/2006 T. Murray and E. Nielsen; Grafton Dauphinais Park max 15 on 5/29/2004 D. Price and W. Miller; Harvard Oxbow NWR max 6 on 5/7/2000 M. Lynch and S. Carroll; Lenox George L. Darey WMA max. 3 on 5/30/2008 F. Model and E. Nielsen; Medford Middlesex Fells max 5 on 5/2/2010 M. Arey; Milford power line, 6 on 5/17/2012, B. Bowker; Newbury Martin Burns WMA max 14 on 5/31/2003 S. Stichter et al. ; North Andover Weir Hill, 4 on 5/15/2010 (ph), H. Hoople et al. ; Northborough Carney Res., 7 on 5/16/2010, S. Moore and B. Volkle; Petersham North Common Meadow TTOR max 6 on 5/25/2009 T. Gagnon et al. ; Plymouth Myles Standish SF max 8 on 5/2/2001 D. Peacock; Sherborn power line max 9 on 5/10/2010 B. Bowker; Stow Delaney WMA max 10 on 5/21/2011 M Arey, and 8 on 5/26/2001 B. Walker and E. Barry; Upton Chestnut St. gas line max 16 on 6/4/2000 T. and C. Dodd; Woburn Horn Pond Mountain max. 10 on 5/31/2004 M. Rines; and Worcester Broad Meadow Brook WS max 18 on 5/16/2000 G. Howe. Also significant are Acton/Concord Fort Pond Brook, 1, 4/29/2012, T. Whelan et al. (ph); Belchertown Quabbin Park; Holyoke Dinosaur Footprints TTOR, 4 on 5/15/2009 T. Gagnon et al; Easthampton Mt Tom; Hubbardston Barre Falls Dam; Royalston Tully Lake; Sharon Moose Hill Farm; Westfield Barnes Airport, 3 on 5/24/2011 T Gagnon. Dreamy Duskywing is univoltine throughout its range, except in the southern Appalachians (Opler and Krizek 1984; L. Harris 1972 reports a partial second brood in north Georgia.). According to MBC records, the single flight period here extends from mid-April to early July at the extremes, through the most numbers are seen in the last two weeks of May and the first two weeks of June (http://www.naba.org/chapters/nabambc/flight-dates-chart.asp). Earliest sightings: In the 23 years of BOM-MBC records 1991 through 2013, the five earliest "first sightings" are 4/16/2000 Westfield, T. Gagnon; 4/20/2012 Plymouth Myles Standish, S. Moore and T. Prince; 4/27/1991 “Massachusetts” T. Dodd; 4/30/2010 Sherborn power line B. Bowker; and 4/30/2004 New Salem D. Small/S. and R. Cloutier. The impact of the especially warm springs of 2012 and 2010 can be seen here. A century ago Scudder reported that the earliest known dates for Dreamy Duskywing’s appearance in New England were May 10 near Boston, and May 11, Nantucket (1899: 1513). This was a well-known and widely collected species, so some reliance may be placed on these dates. BOM-MBC data suggest that Dreamy Duskywing’s first appearance may be occurring earlier now than a century ago. Latest sightings: In the same 23- year period, the five latest "last sightings" of Dreamy Duskywing are 7/7/2008 Cummington, B. Spencer; 7/5/2009 Newbury Martin Burns WMA S. Stichter; 7/1/ 2003 Cape Ann D. Savich and C. Tibbits; 6/28/2005 Newbury Martin Burns WMA, S. Stichter; and 6/28/1992 Worcester, T. Dodd. Thus in only three of 23 years did the last sighting stretch into July; in another 9 out of 23 years it occurred in the last week of June. Dreamy Duskywings are therefore hardly ever reported on the July NABA Counts. Since 2009 the last sightings have been early in June, owing either to lack of search effort or to declining numbers of this species. A century ago Scudder wrote that Dreamy Duskywing was found “throughout June, and occasionally, about the latitude of Boston, until the end of the first week of July” (1889: 1513). The late flight dates in BOM-MBC records are remarkably similar. Kimball (Jones and Kimball 1943) reported for Martha’s Vineyard that Dreamy Duskywing was “double-brooded” but this is probably an error (as pointed out by Leahy in the MAS Atlas), perhaps resulting from confusion with some other duskywing species. Wild Indigo and Horace’s are the only duskywings known to be double-brooded in Massachusetts. It seems likely that this species has declined in Massachusetts with climate warming, owing to its northerly range and lack of a lowland seaboard range in southern states (Table 6). A northward and higher-elevation range contraction would first be noticed in declining sightings from Cape Cod and the islands—and this may already be evident (see above). This species’ decline does not seem attributable to either habitat loss or host plant specialization.